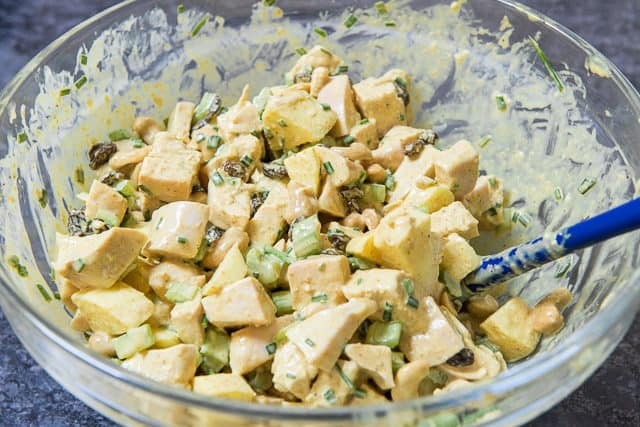 This Curry Chicken Salad is perfect when you’re looking for new flavor variations from a classic chicken salad. It’s great for lunches, picnics, or for keeping on hand in the fridge! Chicken salad is so underrated, and I think it’s one of the best foods out there. Since James is starting school this week, I’ve been trying to think of some lunchbox friendly foods to send with him. Something better and a bit more nutritious than a PB&J, you know? Chicken Salad was one of the first things to come to mind. 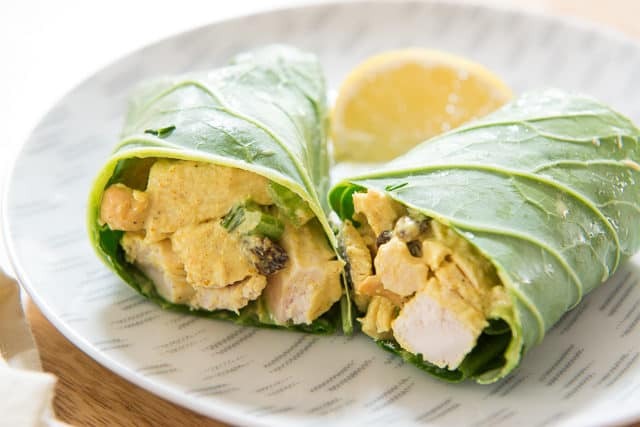 It’s one of those instances where chicken is pleasant to eat cold, it packs lots of protein and healthy fats (if you use a good quality mayo), and most importantly, it’s quite delicious. 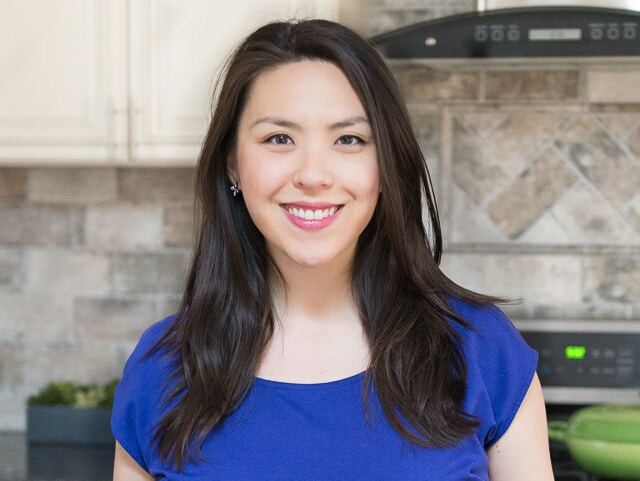 I regularly rotate between many of the salads I’ve posted on this blog over the years, like Cranberry Chicken Salad, Egg Salad, and Salmon Salad, keeping them in the fridge for quick protein and lunches. Curry Chicken Salad is a variation I’ll make every once in a while, when I want to switch it up. I love how the flavors seem so exotic and different, but it’s actually really easy to make, with totally accessible ingredients. The lemon juice might seem slightly unusual, but its brightness balances out the rich mayo, and it also gives it a more buttermilk-like consistency that I find really delicious. I also recommend using a high quality mayonnaise here. You can buy one that uses a healthy oil, or make your own homemade mayonnaise. I use this Crockpot Chicken Breast for the salad. It’s really easy (basically just throw the chicken into the slow cooker), and makes for very moist chicken. 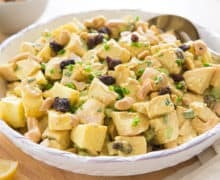 Also, I love using apples for this recipe, but you can also make curry chicken salad with grapes for a different type of sweetness. I sometimes see cilantro in curry chicken salad, but don’t find it to be a good flavor affinity for these ingredients (and I say that as someone who likes cilantro). I like the chives because they provide a nice freshness and onion-like flavor, without being too harsh. Ideally, like with any protein-based salad recipe, you want to let it sit for an hour or two so the flavors can meld, and the raisins can plump, but you are free to eat it right away too. Keep in mind that the cashews will soften as they sit, so if you prefer a crunchy texture when eating, you can save those until you’re ready to eat, and stir them in at the end. Steak Salad, California Cobb Salad, and Zucchini Ribbon Salad are a few of my other favorite salad recipes. Enjoy! 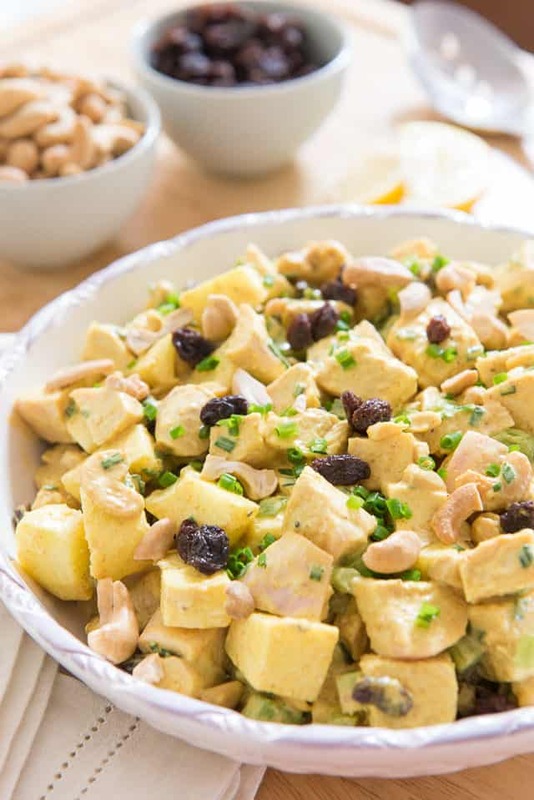 This Curry Chicken Salad is perfect when you're looking for new flavor variations from a classic chicken salad. It's great for lunches and picnics! 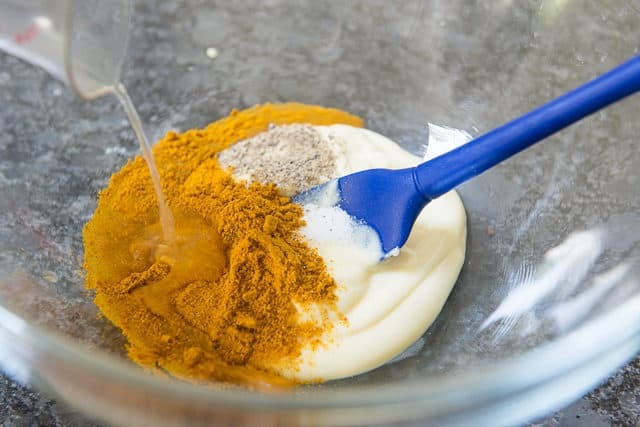 In a large bowl, whisk to combine the mayonnaise, lemon juice, curry powder, salt, and pepper. It should have a relatively thin texture, like buttermilk. 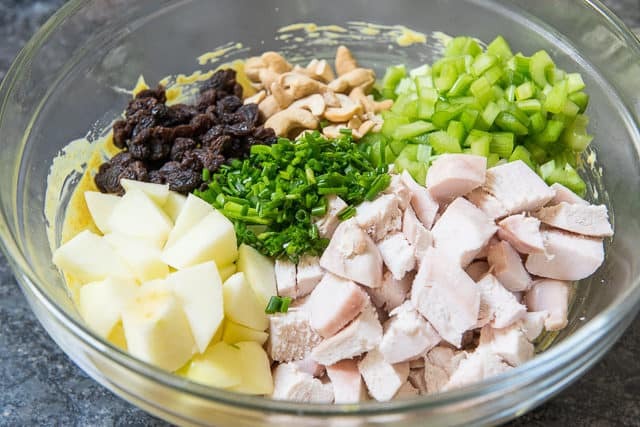 Add the chicken breast, chopped apple, celery, cashews, raisins, and chives. Stir well to coat. 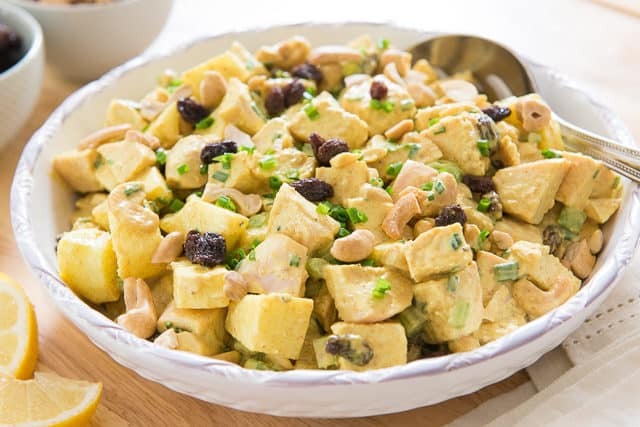 Ideally, refrigerate the curry chicken salad for an hour or two before serving, so the flavors can meld and the raisins can plump. Then enjoy! **Pink Lady is my favorite to use here, but granny smith is great too. You can also do Fuji for something sweeter, but overall I recommend a crisp apple. I need to eat this Curry Chicken Salad more often! This makes for a great healthy lunch! Thank you for sharing! What is the green leaf that you wrapped the salad in? It’s a collard green. Collard wraps are great, and you can use them raw or blanched.